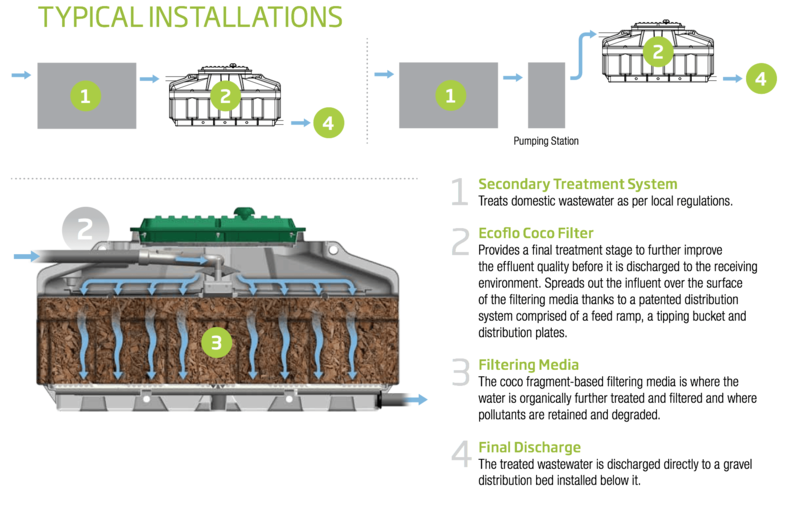 We are delighted to add Ecoflo Tertiary Treatment Filter – domestic and commercial applications – to our range of products. A reliable wastewater treatment system well adapted to all site conditions. Proven performances surpassing the strictest standards. A permanent and ecological solution – no energy needed for the treatment. Pre-assembled, easy-to-handle units to ensure quality installations and less surplus material transported to sites. Minimal final footprint – ideal when the available area for the installation is limited or if separation distances must be reduced. Delivered ready to be installed to minimize civil works and eliminate construction on site. No excavation or relocation at the end of the life cycle of the filtering media (up to 15 years).